The Upemba and Kundelungu National Parks in Democratic Republic of Congo were once teeming with wildlife. 12,000 square miles of magnificent wilderness have been impoverished of wildlife in decades of civil war and lawlessness. An international group of experts gathered in April 2012 to begin work towards restoration. Here at the (not so) Grand Hotel de Lubumbashi in the second largest city in the Democratic Republic of the Congo, the Internet link is very slow, not to mention that the power is on and off and that water in the sink isn’t guaranteed. The years of war led to maintenance decay which is everywhere. One sees what remains of the “glory that was Lubumbashi” when this city was at its heyday. While the people have not been able to effectively take over the maintenance and infrastructure roles we have high hopes that they will see the value in saving the Upemba and Kunedlungu National Parks and look to restoration of the once grand numbers of charismatic animals, large and small. While our international group has one emphasis on animals, we realize that we are helpless without the goodwill of the people in the field who must in turn be supported by the government and the ICCN, (Institute pour Conservation de Congo de la Nature) that governmental agency that heads the several National Parks. Even in this early phase of interaction it is reported from diverse reliable sources that there are significant corruption problems at the ICCN. The meetings were co-chaired by Jean Pierre D’huart from Belgium and ConraAbling from England who did an extraordinarily fine job. The 30 participants were all Congolese with the Frankfort Zoological staff, myself and Bob Ford as the only non-locals. The meeting was convened by a representative of President Kabila who came in from Kinshasa. Here is my new friend Atamato, head ranger from Upemba National Park. What a guy, self educated “un homme exceptionel” who rose through the ranks against all odds. I am simply stunned at how capable and committed the participants are! The meetings continued for days and each person paid rapt attention to every word, took careful notes, followed the agenda and handouts, no one nodded off after lunch. The questions posed to the leaders, the comments contributed to the discussions (all if French of course) illustrated that something quite remarkable was happening there. In attendance here are top level from the capital in Kinshasa near the mouth of the Congo, about 2.5 hours flying to the west. The size and distances are stunning, just one of the 5 World Heritage Sites/Parks is as big as France.The management problems are immense. Imagine trying to restore all of America’s parks after l0 years of war left most of them in a shambles, staff killed or ran away, facilities burned etc. If courage and determination have anything to do with what they will accomplish, the odds are in their favor. Above: In the Frankfort Zoological Society humble headquarters office, my Hero, Project Manager Bryna Griffin (you go girl!) confronts another problem which she will address with calm and wisdom, courage and determination.This young woman from the US is a dedicated powerhouse of the first water. The 2 days of plenary meetings and two more of practical application meetings have drawn to a close and shift into another phase. There is much, very much to do, including interaction with the local university. It is all quite complicated and expensive to accomplish. 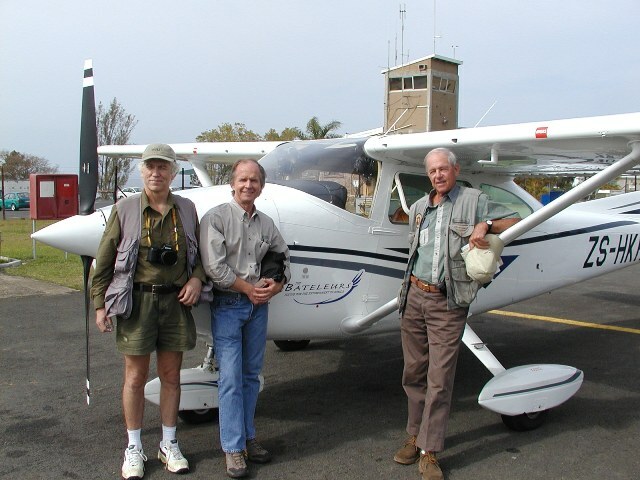 This photo was taken during a South African conservation program of Conservation International’s Russell Mittermeier, the head of theWilderness Foundation Vance Martin and my fellow African Game Ranger Paul Dutton. The image calls to mind the power and effectiveness of Bateleurs, “Volunteer Pilots Flying for Conservation in Africa” whom we are trying to engage in the Congo. I hope readers will share this information as widely as possible to help me as I try to recruit pilots in southern Africa to lend their skills to the conservation movement here that needs them so badly.